Dental assistant rock star habit #1: A rock star DA ensure he or she is properly trained and continuously strives to improve his or her skill set. Dental assistant rock star habit #2: A rock star DA needs to have initiative. 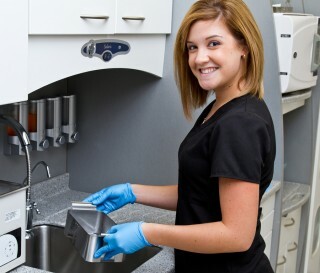 For example, if a dental assistant feels there is room for improvement, they can research what's working for other practices in terms of materials, techniques, etc. Dental assistant rock star habit #3: A rock star DA should ask questions of the dentist in advance such as, “Are you planning a buildup and with what material?” or “Is this a final impression today?”. Dental assistant rock star habit #4: A rock star DA needs to be accountable and take pride in their work. Dental assistant rock star habit #5: A rock star DA needs to know why a procedure is done, not just how it is done. Dental assistant rock star habit #6: A rock star DA needs to be open to constructive correction and criticism. Dental assistant rock star habit #7: A rock star DA needs to predict what instruments or supplies the dentist will need. Dental assistant rock star habit #8: A rock star DA should always look at the upcoming two days to help organize and plan accordingly. Dental assistant rock star habit #9: A rock star DA must truly care about patients and want to help them. Dental assistant rock star habit #10: A rock star DA should always chat with a patient after the dentist leaves the room letting the patient know the dentist is the #1 dentist they’ve ever worked with and that the treatment recommended is spot on. Dental assistant rock star habit #11: A rock star DA must be able to communicate effectively when answering questions or explaining treatment to patients. Dental assistant rock star habit #12: A rock star DA must be able to communicate effectively to the Treatment Coordinator when passing to the patient to ensure the patient’s needs are met.